Built at the English Electric Vulcan Foundry Works, Newton-Le-Willows, Lancs, this was the first English Electric Type 4 to be constructed with centre headcode panels. She entered traffic on the 17th May 1961 allocated to Neville Hill shed ( 55H ) and was one of four class 40's allocated to Neville Hill for use on the short lived " Queen of Scots Pullman " the locos in question being D345 to D348. January 1963 saw the loco re-allocated to York shed (50A) were she remained until January 1967, when she was transferred to Healey Mills. October 1969 saw her move further north when she was allocated to Gateshead depot in the North East. Under the new TOPS re-numbering scheme 345 was re-numbered 40145 in January 1974. February 1976 saw 40145 transferred back to Healey Mills depot, where she remained until October of that year when she was once again allocated to Gateshead depot. March 1978 saw the locomotive move to Scotland when she became a part of the Haymarket fleet, however this move was only short lived and two months later in May 1978 she found herself allocated to Longsight depot on the Midland region. 40145 was finally withdrawn from BR service on the 10th June 1983, after suffering derailment damage at Stourton Yard, Leeds. After the derailment the locomotive was dragged to Crewe Locomotive Works arriving there on the 13th May 1983, for an inspection pending possible repairs but due to the rundown of the class the work was never authorised and the locomotive was withdrawn instead. Also while the loco was at Crewe Works, all the air brake equipment was removed for reuse on other locomotives together with various vacuum brake parts. During 1983, two class 40's were put on the tender list and offered up for sale, these being 40106 which was withdrawn on Crewe TMD and 40145 which was still at Crewe Works. In December that year, 40145 was successfully purchased for preservation by the Class 40 Preservation Society (CFPS) who moved her to the East Lancs Railway at Bury during February 1984. A mile stone in the groups history came on Sunday 1st September 1985, when after a lot of hard work the loco moved under her own power for the first time in preservation. However it was not until July 1987, that the loco worked its first public service train on the ELR when the line from Bury to Ramsbottom was reopened. The group also stole the show at the East Lancs 1991 diesel gala, when 40145 appeared as 40445 ion Large-Logo livery complete with Scottie dog stickers, large numbers, ETH jumper cables and even working headlights. Although none of the class ever carried this livery, it was interesting to see what might have been had the Scottish Region retained its allocation of Class 40's for a few more years. Now back in BR blue livery with full yellow ends, 40145 was invited to the 1994 Crewe Basford Hall Yard open day along with sister loco 212 Aureol. This was the first time these two locos had been together since becoming preserved. The highly successful event encouraged the organiser to hold a similar event the following year, only this time around there was three Class 40's on show, making another first for all class 40 enthusiasts to enjoy. At the event was 212 Aureol and 40145 which were both positioned side by side again with 40135 taking her place further down the yard amongst the green liveried loco's. This was also the first time that all three headcode variations had been together at the same event since ending their careers on BR. 40145 also visited other preserved railways and during September 1995 the loco made a guest appearance at the West Somerset Railways Autumn diesel gala. This was the first time the loco had worked on another preserved railway since she became preserved and was new ground for the class, travelling over the West Somerset line. In 1997, the group repainted the loco into all over Dark Brunswick Green livery and numbered her D345. 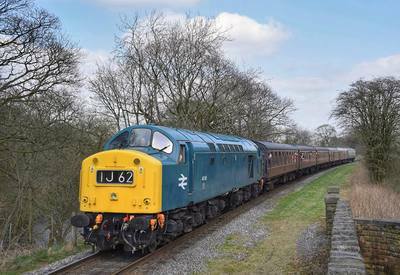 She re-entered traffic at the East Lancs Summer nine day "Mega” diesel gala. At the start of 1999, the group applied small yellow warning panels to the loco. During September 1999, the loco paid another visit to the West Somerset Railway to take part in their autumn diesel gala. With D345 now in green livery this become the first ever green class 40 to travel over the line. The loco also holds the position of being the only class 40 to travel over the West Somerset line in both blue and green liveries. From the West Somerset Railway, the loco travelled to the Severn Valley Railway to take part in their autumn diesel gala. From here the loco headed North to the North Yorkshire Moors Railway for more action during the railways diesel gala held on the 5th and 6th November, before returning back home to the ELR. History was made on 28th October 2002, when D345 ( 89445 on tops ) triumphantly returned to the main line after a gap of some fourteen years, since sister loco D200 hauled the last class 40 rail tour over BR metals, from London Liverpool Street Station to York via Norwich on 16th April 1988. The loco worked two test runs between Crewe and Carnforth with a rake of empty stock and 37038 dead in tow for insurance purposes. On Saturday 30th November 2002, the loco headed a Pathfinders “Christmas Cracker IV “rail tour along the North Wales Coast line to Holyhead. The tour started from Crewe, then via Birmingham New Street on the outward journey to Holyhead, returning via Manchester Victoria to Birmingham. D345 performed faultlessly throughout the day and arrived back early at Birmingham on the night. On 05:04:03 the loco worked a Birmingham-York-Newcastle rail tour, which was the second mainline tour for the loco and again was a great success. The locomotive was turned out with newly applied full yellow ends which gave a fresh appearance to the loco after several years carrying a small yellow warning panel. On 06:09:03 the locomotive now repainted in BR Blue Livery with full yellow ends (sponsored by Beaver Sports) worked the Capital Whistler rail tour from Crewe to London Kings Cross and back. Since then the locomotive as worked a whole range of rail tour throughout the country and has become a very reliable loco on the main line. 25th July 2007 saw the loco repainted into Large-Logo Livery once again at the East Lancs Railway. The loco was unveiled at Bury Bolton Street Station on 25th July in its new livery and named “East Lancashire Railway “as part of the East Lancs Railways 20 year celebrations. The name plates were previously carried by EWS Class 37 number 37418. On 4th September 2010, 40145 suffered a traction motor flashover near Grantham whilst working the CFPS's 'East Lancs Explorer' Railtour from Rawtenstall to Cambridge. Further investigations discovered serious generator damage meaning a longer and much more expensive repair job than first thought. 40145 moved across to Barrow Hill for the work to be carried out which involved lifting out the power unit and sending the main generator away for repairs which turned out to a very expensive job. In the meanwhile, attention turned to other remedial and internal works on the loco while they were waiting for the generator to return. The repaired generator was delivered back to Barrow Hill on 23 April 2013 and it was not long before the generator was reunited with the power unit and returned to the loco. The power unit was successfully started on the 15th of May and later put on the load bank at Barrow Hill which revealed problems with the fuel pumps and injectors. These where all later removed and sent away for attention. By early November 2013, the loco, now in BR Blue livery and numbered 345, was complete and re-certified for mainline use. A celebration running day took place on Sunday 16th of February 2014, marking 30 years to the day since 40145 arrived at the East Lancashire Railway back in 1984. 17:05:61 Neville Hill Leeds. ( 55H ). 01:63 York. 1:67 Healey Mills. 10th June 1983, after suffering derailment damage at Stourton Yard, Leeds. Current Livery: - BR Blue.